Pele has done endorsement work for a range of brands, but never signed on with Samsung. Brazilian soccer legend Pele has slapped Samsung with a $30 million lawsuit for publishing a newspaper ad with a Pele "lookalike." The 75-year-old Pele, whose birth name is Edson Arantes do Nascimento, set Guinness world records with his soccer goals and was declared a national treasure in Brazil. The majority of his earnings now comes from endorsements. His lawsuit claims Samsung acted in a "willful and outrageous" manner by promoting a new widescreen TV with a Pele "lookalike." Pele and Samsung had been in talks in 2013 about using Pele in an ad campaign, but Samsung pulled out at the last minute, according to the court document, which was filed in Chicago this month. The company subsequently published an ad in the New York Times in October showing the face of "a smiling man who very closely resembles Pele" next to a television displaying a soccer player making a "scissors-kick, [which was] perfected and famously used by Pele," according to the filing. 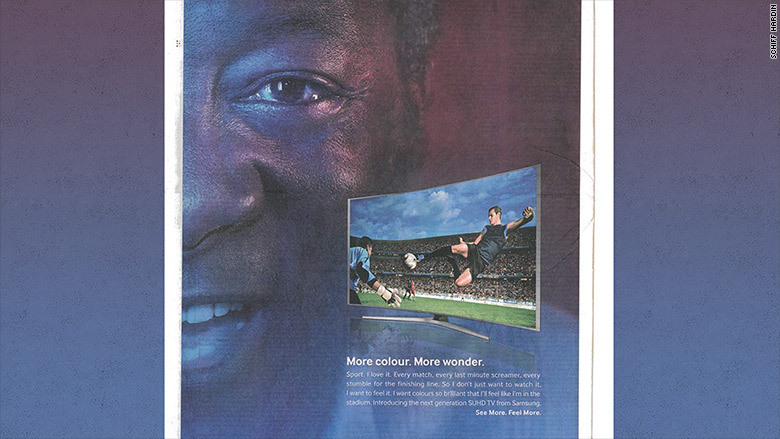 Pele is suing Samsung for this "lookalike" ad that was featured in the New York Times. The lawsuit is seeking at least $30 million, claiming the ad enriches Samsung while infringing on Pele's publicity rights and diluting his brand value. "The goal is to obtain fair compensation for the unauthorized use of Pele's identity and to prevent future unauthorized uses," Pele's lawyer Fred Sperling told CNNMoney in an email. Samsung did not respond to CNNMoney's request for comment on the case. Pele is being represented by the same lawyer who won a similar case for Michael Jordan. Last summer a jury awarded the basketball superstar $8.9 million in a lawsuit Jordan filed against a grocery store. He said the company used his likeness without his permission. Jordan sought more than $10 million in damages and revealed the value of his existing endorsements during the trial to prove the value of his likeness. 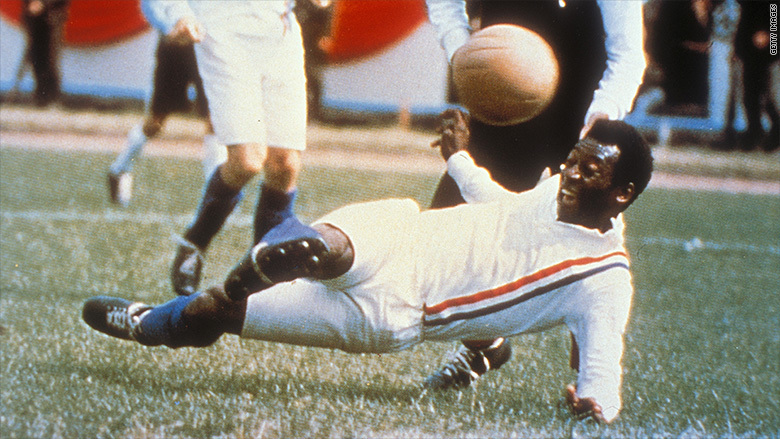 Pele is famous for his "scissors-kick." 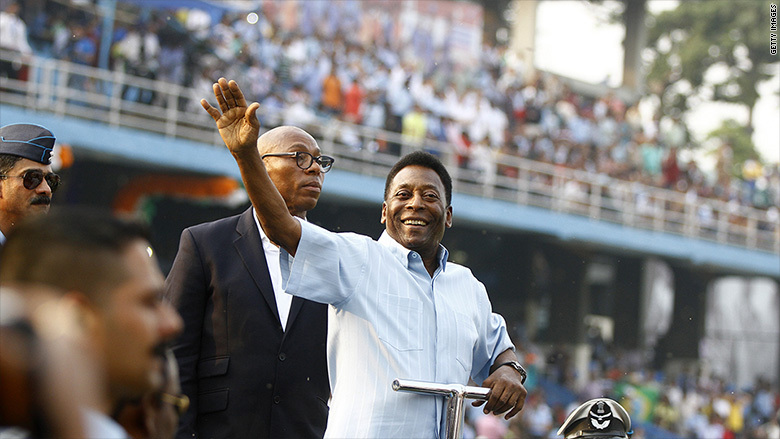 Pele has promoted a range of brands, including Emirates and Viagara.